Our patented interface taken to a whole new level. 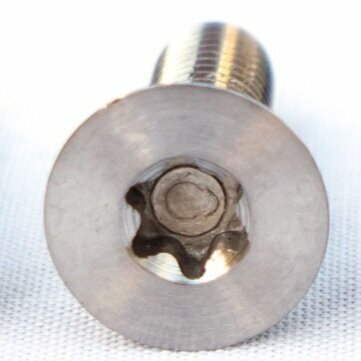 Fixed angle board cleats with titanium mounting hardware. For use with factory-built splitboards only. Our fixed angle Solo Cleats reduce the cleat part count by 35% and cut the weight in half while increasing overall strength and reliability. The updated interlocking system further reduces issues associated with icing. For use with factory-built splitboards only. Available in increments of 3 degrees (+30 to -30) to match your stance. Adjustable stance widths in 1" increments. The cleat plates and cleats themselves are available in Silver (nickel coated). You choose the color of the titanium mounting hardware - available in Black, Gold, Silver, or Rainbow. IN STOCK! 0, +/-9, +/-18, +/-21, +/-24 AND +/-30 SOLD OUT. Please read through the OPTIONS and the text below before placing your order. Select front foot angle and add to cart. Repeat for back foot. If you ride the same angle front and back, select your angle and change the Quantity to 2. Mounting hardware color preference will be collected upon adding to cart. NOTE that the pricing above is per front foot/back foot pair. The total price for a complete set of (4) fixed angle cleats including hardware is $190.